August 26, 2011 August 26, 2011 C21MM1 Comment on Installing Energy Efficient Windows to your Home Adds Value! Installing Energy Efficient Windows to your Home Adds Value! It’s August, and it is HOT! If you are considering upgrades to your home, the first thing to consider is new dual pane windows. Energy efficient windows not only save on energy bills, they also block a lot of unnecessary noise. And, as an added bonus – installing new windows will add value to your home. Of course, whatever the season, nothing beats the blues like a light-filled room. However if you don’t think you can afford energy efficient windows, consider your options; repair, retrofit or replace. Vinyl – affordable, low-maintenance, usually only come in white and they may fade. Aluminum – affordable, strong, low maintenance, but not a great insulator. Wood – beautiful, expensive, great insulator, must be maintained. Composite – Stronger than wood or vinyl, mid-priced and paintable. Aluminum or Vinyl Clad – top of the line with wood inside and either aluminum or vinyl on the outside, minimizes transfer of heat and cold, low maintenance. Single and double-hung – classic styling, easy to clean, opens up and down. Gliding – slides side to side, usually one side is fixed and one side slides. Casement – opens with a crank, great for catching and pulling in a breeze. Fixed – often called a picture window, great way to enjoy the view and bring in light. Low-E – see-through metallic coating reflects heat in summer, keeps heat from escaping in winter. R-Value – measures the resistance of heat flow. The higher the R-Value, the more efficient the window. U-Factor – measures heat transfer from inside to outside. The lower the U-Factor, the more efficient the window. Shatterproof Glass – at least twice as strong as regular glass, has plastic sheeting sandwiched between two panes of glass. Also has a Low-E rating and isolates the outside sound. Dual Action Coating – the coating keeps the glass clean by breaking down organic matter as it collects on the glass. Do they function properly? Often windows in old homes are painted shut, and, if they do open, they do not open or close easily. Is cold air seeping in around your windowpanes? Do you feel the heat from the outside radiating to the inside? Is the framing material in good condition? Wood may be rotted, metal rusted, aluminum corroded, or vinyl faded or stained. Is the glass broken or cracked? Is the glass clean and clear? Is the glass paint stained or water etched? Is the hardware old and dingy? Do the locks work? Are the screens intact? It is important to factor in all of these conditions when you are deciding how to improve the energy efficiency of your windows. It is also important to keep in mind the style of your home. Any changes that you make may affect the character of your home. For instance, if you live in a period home with stained glass windowpanes, changing them may affect the value of your home. Repair – get an estimate to repair your existing windows. 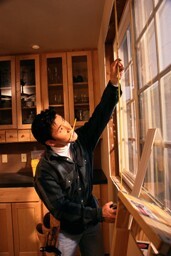 Windowpanes can be replaced and framing materials can be cleaned, sanded, painted, and/or restored. Hardware can be restored or replaced and caulking will reduce the leakage. Retrofit – There are many inexpensive ways to improve the energy efficiency; roll up shades, awnings, and the addition of reflective film. You might also consider adding storm windows. Replacement – If you are tired of struggling with windows that get stuck, cracked panes, peeling paint, locks not working, it is probably time for replacements. Keep in mind, if the exterior shell of your home is not properly insulated, spending top dollar on high-end energy efficient windows may not be a cost-effective solution. Whether you are repairing, retrofitting, or installing replacement windows, first evaluate the condition, then consider your options and finally enjoy the cost-effective, energy efficient decision that you made. I can vouch bigtime for energy efficient windows adding value to your home. I got a set of Andersen through CitiQuiet here in Philly and ended up selling my house not soon after. I didn’t get a chance to really reap the energy savings, but I was able to sell my house at a huge premium since this was at the height of the “green” craze.